TWENTY YEARS AGO on this date, I arrived in Moscow and got my first taste of former Soviet “hospitality” which was basically “nyet”! We arrived at Moscow’s Sheremetyevo 2 Airport at 4am (total travel time from KL – Moscow was approximately 18 hours); checked into Hotel Salyut, the 26-storey hotel built for the 1980 Olympic Games in Moscow. On day one, our first stop was the Red Square and its surrounding attractions including the State Historical Museum, Lenin Mausoleum and the State Department Store GUM . In the evening, we paid a courtesy visit to the Malaysian Embassy in the Russian Federation, and one of the officers graciously hosted dinner. (Top, L-R) Yes, we were also in Moscow; view from my room in Hotel Salyut that formed part of the Olympic Village; (Bottom) A visit to the Red Square on Day 1. Day 2, Monday 19th July 1993: We visited Lenin Hills (now Sparrow Hills) which is one of the highest points in Moscow, and Kremlin which is also the official residence of the Russian president. Described as Moscow’s central and oldest part that has the world’s most beautiful architectural ensembles, the Kremlin walls form an irregular triangle. Located within the walls are the Tsar Bell and Tsar Cannon, a few cathedrals and museums opened to the public. We lunched at Hotel Moskva near Red Square, which I understood was demolished in 2004; rebuilt and completed in 2009. Another nearby Hotel Rossiya which was built in the 1960s, closed down in January 2006 and was eventually demolished to make way for other projects on the priced prime land. (Top, L-R) At Lenin Hill, Moscow State University in the background; Dormition Cathedral (later re-named Assumption Cathedral) is the oldest church in the Kremlin where the first Russian tsar Ivan the Terrible was crowned, as was the last tsar Nicholas II; (Bottom, L-R) The Tsar Bell is the largest bell in the world; standing outside Hotel Rossiya not knowing that it would be brought down 13 years later in March 2006. Later, we took a tour of Moscow’s famed underground metro and experienced a ride on it. To Muscovites, the metro is simply a means of daily transportation; millions pack into the stations daily and probably don’t bother taking a second look at the beauty of its ornate designs. To an outsider like me, the underground world created by Soviet engineers came across like an art gallery. Each station was a work of art in itself, having unique designs and using various materials including marble, mosaics and stained glass. 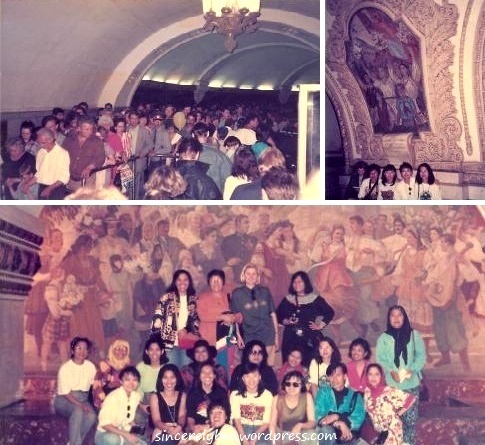 (Top, L-R) People packing into one of the metro stations; an artistic piece of wall deco; (Bottom) Group photo with the backdrop of a huge mural in the underground metro. In the evening, we watched a circus performance, and went on to catch a train to St. Petersburg the same night. 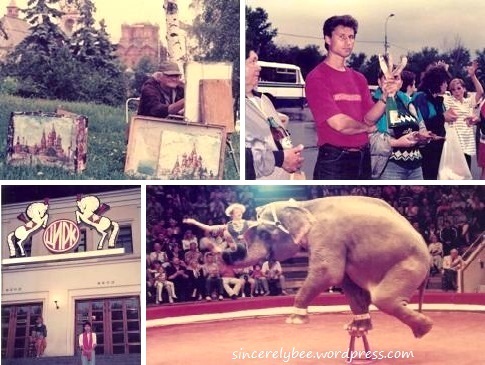 (Top) Scenes of Moscow life; (Bottom) The Circus Hall. Day 3, Tuesday 20th July 1993: After an 8-hour train journey, we arrived in St. Petersburg and checked into Hotel Pulkovskaya. Went on a city tour to Neva Embankment, around St. Isaac Square and the Church of Christ’s Resurrection aka the Church of the Saviour on Spilled Blood, built between 1883-1907 in memory of Tsar Alexander II who was assassinated on that site. The Church of Christ’s Resurrection is said to use the most mosaics compared to other churches in the world; St. Isaac Cathedral is the largest Russian Orthodox cathedral in St. Petersburg. Later, we went to Peter & Paul Fortress and saw its cathedral, museum and prison located within. That evening we checked out Victory Square near the hotel. (Top) Locals enjoying their day out in the sun by Neva River; (Bottom, L-R) At the entrance of Peter & Paul Fortress; souvenir stalls by the river. 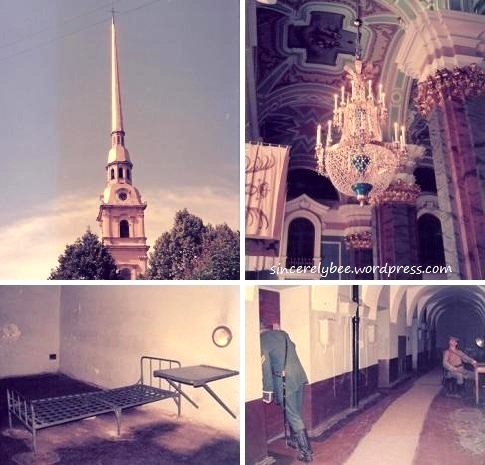 (Top) Peter & Paul Cathedral is the oldest in St. Petersburg; its glitzy interior; (Bottom) The prison that once held prominent political prisoners. On Victory Square is the Monument to the Heroic Defenders of Leningrad, erected in 1975 to commemorate the 30th anniversary of Soviet’s victory in the Great Patriotic War. Day 4, Wednesday 21st July 1993: A must-visit to Peterhof, the former summer residence of the Russian emperors which boosts of a sprawling compound comprising palaces-turned-museums and gardens filled with fountains. The majestic cascades of fountains were under renovation at the time of our visit. That didn’t stop me from writing a glowing article on Peterhof (link) upon my return later. (Top) At Peterhof, musicians playing in the park; (Bottom) The interior of the palace; sandals called tapki are worn to protect the flooring. In the afternoon, we went to Palace Square where the Alexander Column and Hermitage are located. Alexander Column, listed as one of world’s biggest granite monolith, was erected between 1830-1834 to commemorate Soviet’s victory over France in the 1812 war. The Hermitage, formerly the Winter Palace for the emperors, is now a museum that holds millions of exhibits. It is often said that if one were to take just one minute to look at each item, it would still take him years to see them all! Alexander Column and the Hermitage on Palace Square. Our visit to St. Petersburg ended at the theatre watching a performance of Russian military songs and folk dances. A military and cultural performance ended our visit to St. Petersburg. Day 5, Thursday 22nd July 1993: Took the train back to Moscow, had a meeting with some Russian journalists. 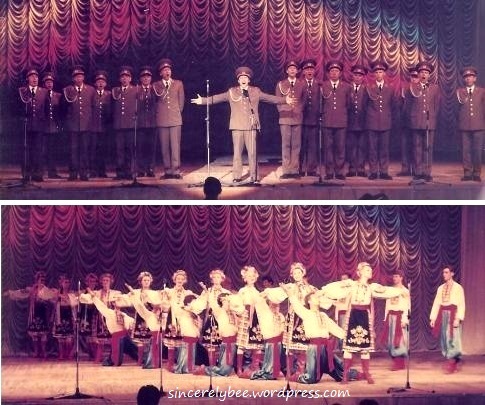 Day 6, Friday 23rd July 1993: до свидания Moskva! (pronounced dasvidanya meaning “goodbye”; our next destination was London! Looking back 20 years ago, I recalled picking up two Russian words – “nyet” (no) and “spasiba” (thank you) even though there weren’t much to be thankful for! Twelve years on when Moscow became home in 2005, I picked up a lot more Russian. 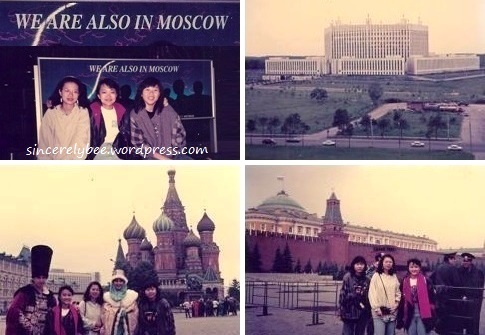 This entry was posted in Memories of Moscow, Travel Back in Time and tagged Moscow, Russia, Star, Travel. Bookmark the permalink.